The locals are nice. You can sun bath at the beach. It's a lovely place to relax, especially with the traditional masseurs at the beach. But none of these are the reason you are here. There's only one activity that beats all else. Almost immediately into the water from the beach, just a few meters down, you will spot an underwater wonder world. The thriving coral reefs over here are absolutely exploding with a diverse marine ecosystem. Expect to see more kinds of fish then you can reliably recognize. These include Titan Triggerfish, trumpet fish, Parrotfish, sergeant majors, butterfly fish, bat fish, angelfish, dolphin, Anemonefish, and Blue-spotted Stingrays. There is also a small wooden shipwreck in the water. Do not confuse this for the more famous Japanese break which is a few kilometres to the east. There are plenty of places to rent snorkeling gear near by. How popular is Lipah Beach? People normally club together Biorock Pemuteran and Garuda Wisnu Kencana Cultural Park while planning their visit to Lipah Beach. People also prefer to end their day with Lipah Beach. Love this beach. Beautiful and relaxing. Snorkeling can be done off the beach. Lots of small restaurants in the area, not bugged by the usual beach hawkers. Just lovely. Just one downside - don't expect to make use of the beach chairs for free - you have to pay for these and umbrellas by the hour!!! No bars, only one restaurant. Very strange guys who sold us two beach beds for two hours... Talked the hole time to us and at the end they wanna to have a lot of money. We felt like an European money cow. Absolutely not nice. 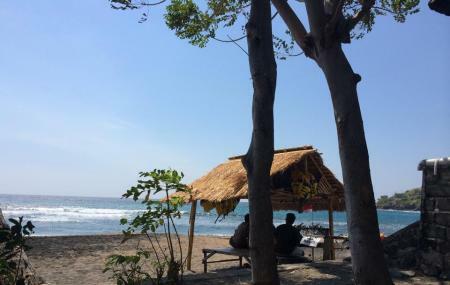 Nice sandy beach in Amed with rich and colorful reef.